Check out this absolutely BREATH-TAKING 1989 Batman: The Dark Knight illustration which was drawn ENTIRELY by the great Frank Miller not soon after his WORLD RENOWNED Batman: The Dark Knight mini-series! This Pinup features a nice large image of THE BATMAN, with a pissed off look on his face with his fists clenched! The Female ROBIN has her hands on hips and she is drawn magnificently as well! This art is very detailed, and was very thought out by Frank Miller, drawn on DC cover stock art board as a VERY SPECIAL Birthday present for the late great DC editor JULIUS SCHWARTZ, for his 75th birthday! Frank Miller spared no expense, and took his time to draw a true Masterpiece right here for the greatest DC Editor of all time! Art is again drawn on 12 by 17 inch DC COVER STOCK art board and is inscribed: "HAPPY BIRTHDAY JULIE, DON'T EVER BE LATE ON THE JOB" and it is signed in full script at the bottom! 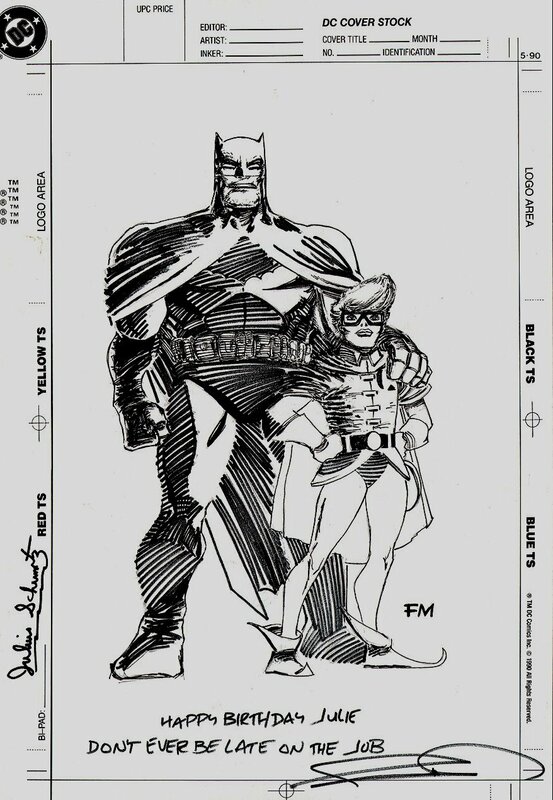 The art area itself has the same exact "FM" block letter signature that Frank Miller used on all 4 of his Batman: The Dark Knight Covers he drew! Art is also signed by the great JULIUS SCHWARTZ to the left of the drawn art margin! I don't believe there has EVER been a FRANK MILLER BATMAN piece quite like this "RARE" one of a kind item which was drawn on DC COVER STOCK! ALL art on our website (including this one) are able to be purchased with VERY fair time payments, and trades are always considered towards "ANY" art on our website! Just send us an email to mikeburkey@aol.com and we can try to work something out.